January 3rd, 2012 - We recently did a full spread on Farmhouses Al Fresco, where KNSTRCT examined the way farmhouses are evolving with modern architecture. Today's architects are pushing the boundaries on these countryside homes by transforming them from a simple hay-holding barn, to full blown residences. 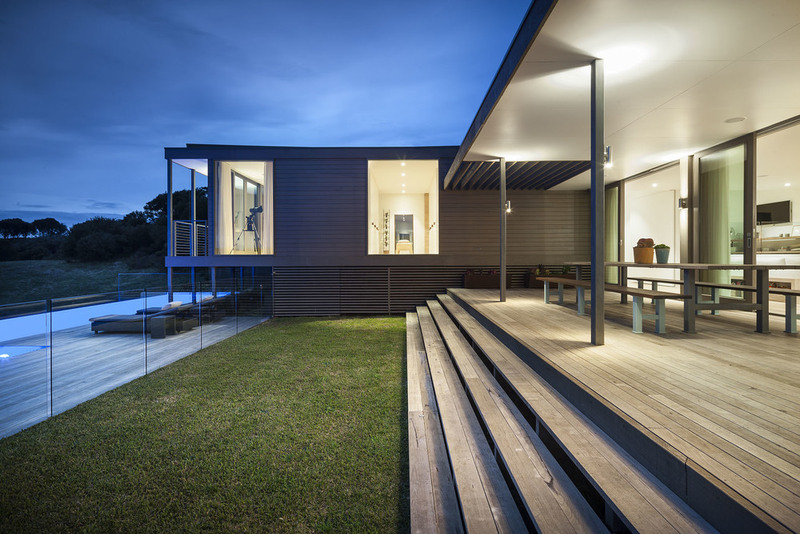 The most recent to catch our eye is The Fingal Residence by Australian-based JAM Architecture. 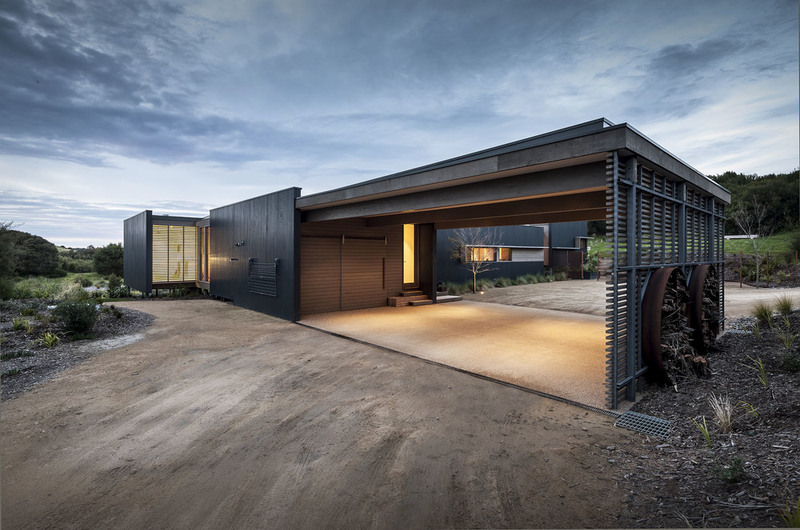 The dark wood homes is located on the stunning Mornington Peninsula in Victoria, Australia, where rolling hills, meet rugged cliffs, all the way to the crashing waves on the shoreline. The architecture of the home gives a humble nod to the design of old farmhouses with rich color wood slats, and open garage to pull up trucks and tractors, and a large sliding barn door. The architects took these throw-back elements and added a contemporary twist by introducing clean linear lines in the architecture and a minimalistic aesthetic. Long reclaimed wood steps with flowers, hand-planted in metal baskets, lead the way to the homes entrance. Above the steps, a white canopy ceiling trails from the outside garage all the way into the interiors making the design cohesive as visitors pass through the frameless, floor-to-ceiling, wood slatted door. 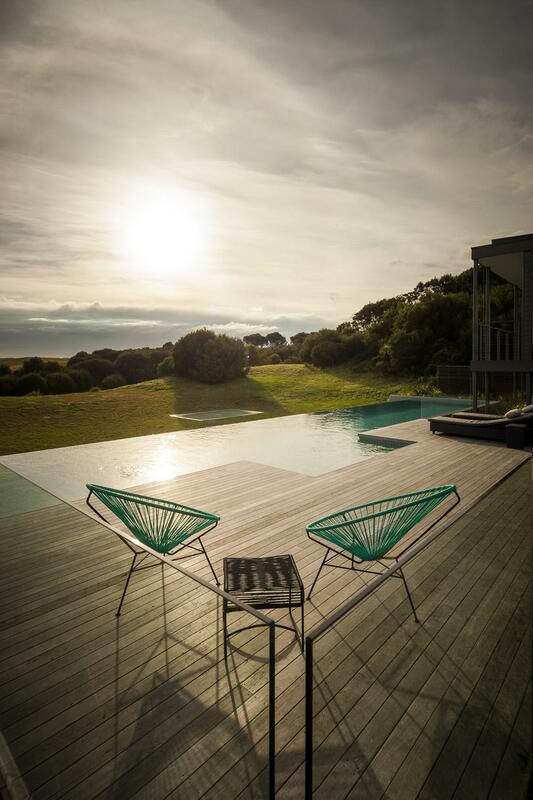 Furniture designer, Ocho’s Acapulco String Chair provides a place to relax while admiring the picturesque view of the rolling hills that lead to the bluffs in the background of the symmetrical pool. Typical barn house interiors? Not so much, but not that far away! Stark white walls create a canvas for washed wood accent pieces, thick shelving, mid-century dining room chairs, and dark meal birdcages for lanterns. 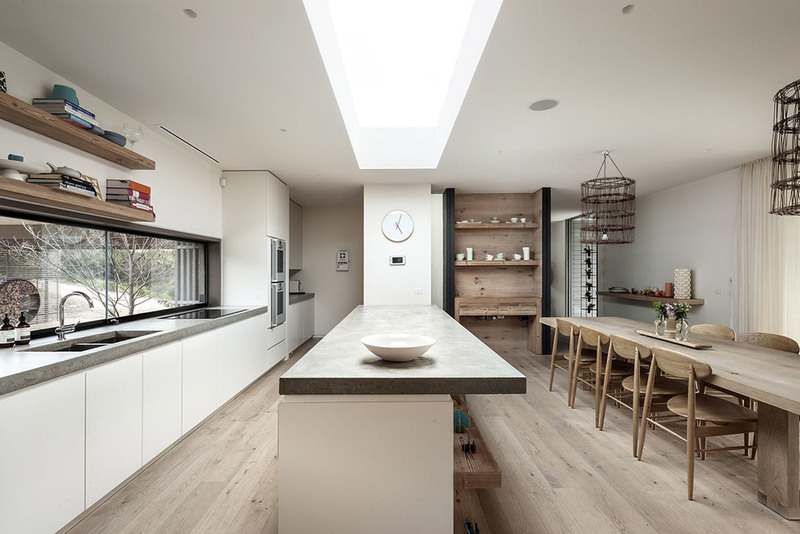 A long skylight allows for natural light to pour into the kitchen, while the birdcages illuminate the dining room. The public areas of the home are open to one another as the private areas and bedrooms are tucked away to the second level of the house. Each room is elevated to the second floor and has a magnificent view. 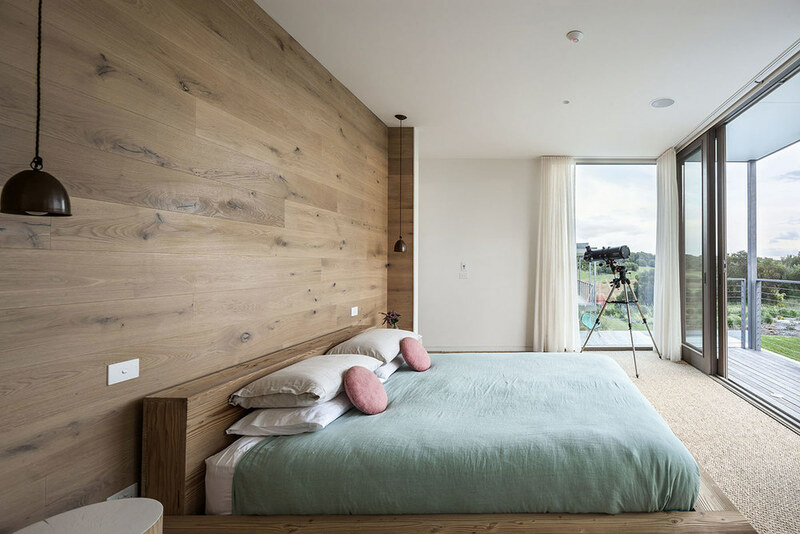 The bedrooms continue the minimalistic concept of the home with sparse furniture, wood walls, and a low bed frame. Because the Fingal Residence does not have very many neighbors, JAM decided to take advantage of the quiet property by allowing the master bathroom to fully open up to nature.